Hairstyles with bangs are current and fresh for today. Getting bangs can be a fun and exciting way to update a hairstyle. Bangs are definitely in for 2018, and we have collected dozens of great ways to wear this trend every day. Different types of bangs can soften a haircut or bring it into precise focus. Bangs can be worn heavy and long or wispy and short, or somewhere in between. Depending on which effect you want and which features you would like to highlight, there are countless options to try for women’s haircuts. 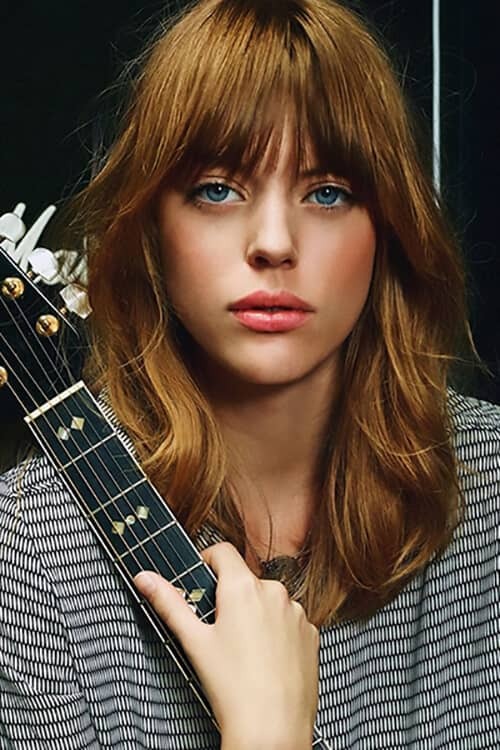 These are some of the best looks for bangs out there today. Hairstyles with bangs start simple, by cutting the front of the hair shorter than the rest. 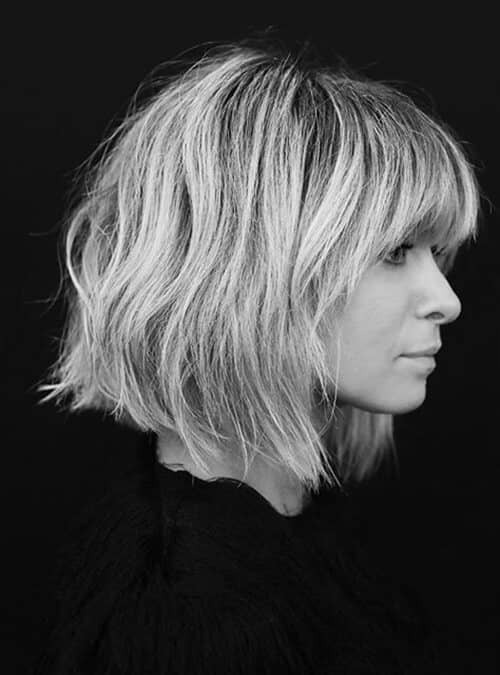 You can cut a wispy fringe along the edge or start higher on the crown of the head and make a statement. Bangs are popular because they are so versatile and they look great on everyone. 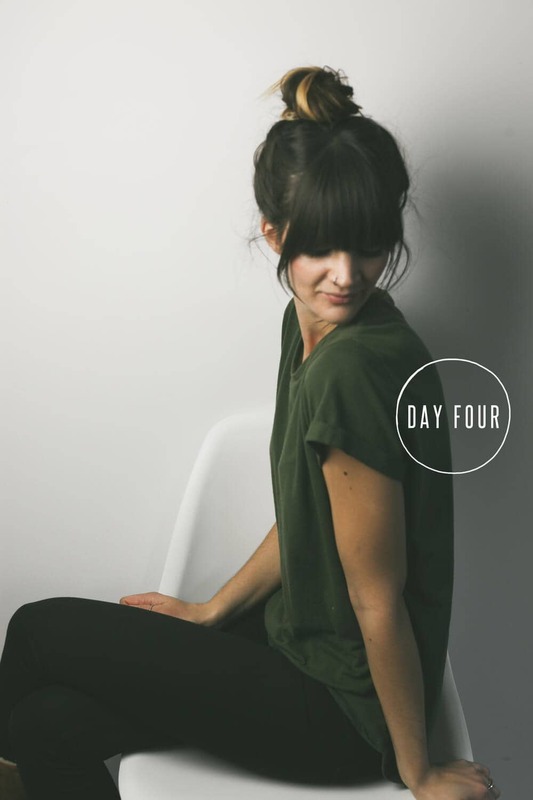 Having bangs can freshen up your style and flatter your facial features. Sometimes people can be a little hesitant to cut bangs in their hair, feeling like they are making a commitment they’re not ready for. 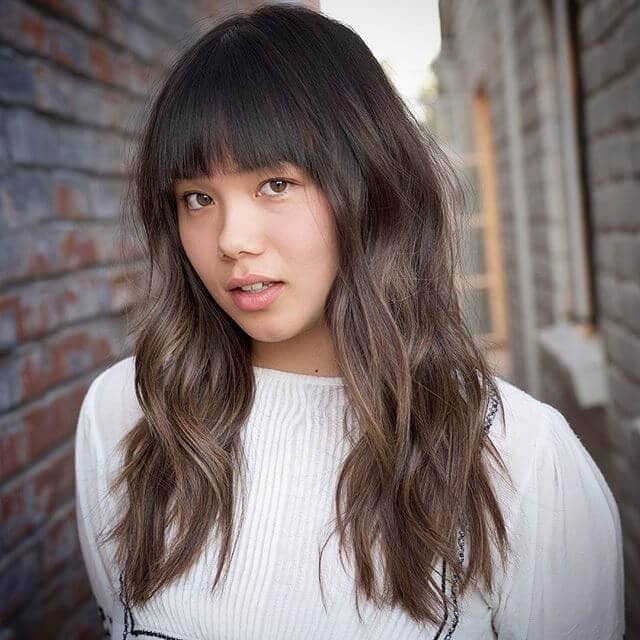 It’s true that growing bangs out can be a frustrating process, but we have many looks for longer bangs, meaning that you can style your hair nicely even when it is in the middle of growing out. These bangs are cut just below the eyebrow for a modern look. They are cut straight across with a little bit of variation. The sides of the bangs come down to frame the face for a sweet and charming look. This pretty hairstyle is worn with a comfortably messy bun. These bangs are cut in a wispy style and are gradually layered into the hair. They are worn casually with a softly messy wave. 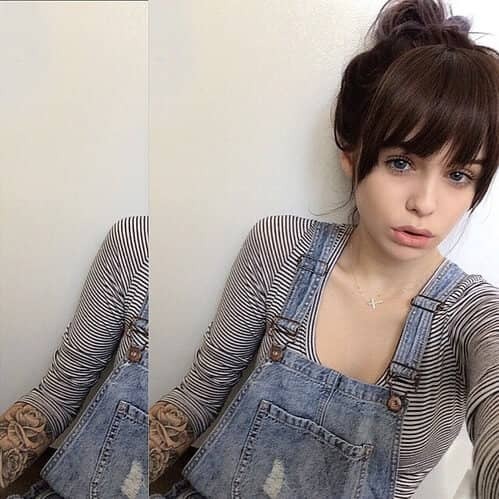 Medium hair with bangs looks great on everyone. The hair is blow-dried in loose finger waves for texture. This hairstyle is relaxed without being sloppy. This haircut idea is simple and layered. The bangs are cut long across the forehead just below the eyebrow. These bangs are layered into the hair along the sides of the face. The hair is styled in relaxed waves to complement the casual bangs. The hair has a subtle wave that flatters the model’s face. 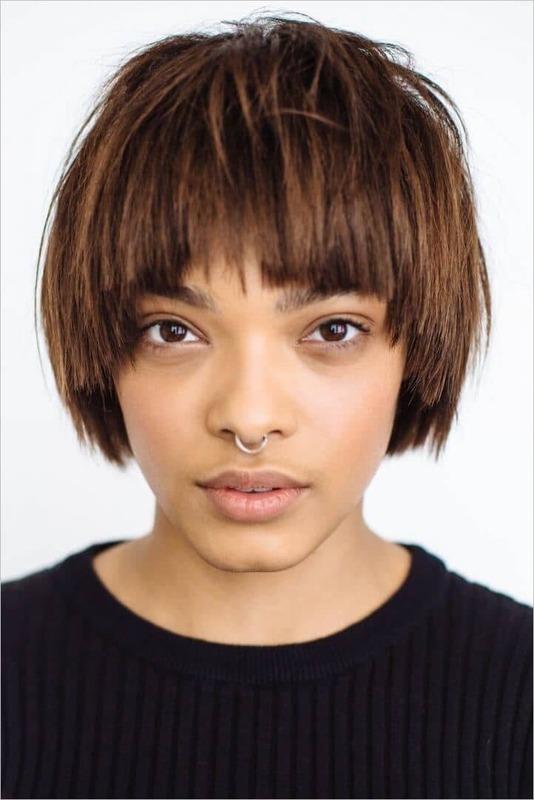 These bangs are cut to nearly cover the model’s eyes. They are blended into the sides of the hair using layering. These medium length haircuts are easy to style and even easier to wear. Long layers are cut into the hair using a razor. This hairstyle is worn in a relaxed way. These bangs are worn long and swept to the sides for a natural look. Tucked behind the rest of the hair, these bangs are held back either by the ears or by strategically placed bobby pins. The model has a pretty pink hair color and this makes her style look special. This model has gorgeous red hair and bangs that cover her eyebrows. The bangs are longer toward the sides and blended in using long layers. The bangs frame the model’s face and highlight her eyes. The hair is worn long with beautiful loose waves. It is worn up partially in the back. These bangs follow the natural part in the model’s hair, blending in beautifully with her haircut. The bangs are layered in gradually along the sides. They are worn swept to either side, framing the model’s face. The haircut is gently tousled for a soft and relaxed look. This model’s bangs are cut straight across at eye level with a little bit of tapering toward the sides. These bangs are longer than most and are not layered into the hair at the sides of the face. The look is relaxed and easy with long layers, worn a little longer in the front than in the back. This model’s beautiful hair is worn long in loose, relaxed waves. Her bangs are cut straight across the forehead at eyebrow level. They are gently layered along the sides of her face. Since these bangs are cut at eyebrow level, they draw people’s attention to the model’s eyes. This model has long hair with a lot of layering around the shoulders to give it movement and less weight. The bangs are worn just short of eye level. This haircut idea is great for anyone who has long hair but wants to keep it from being boring. 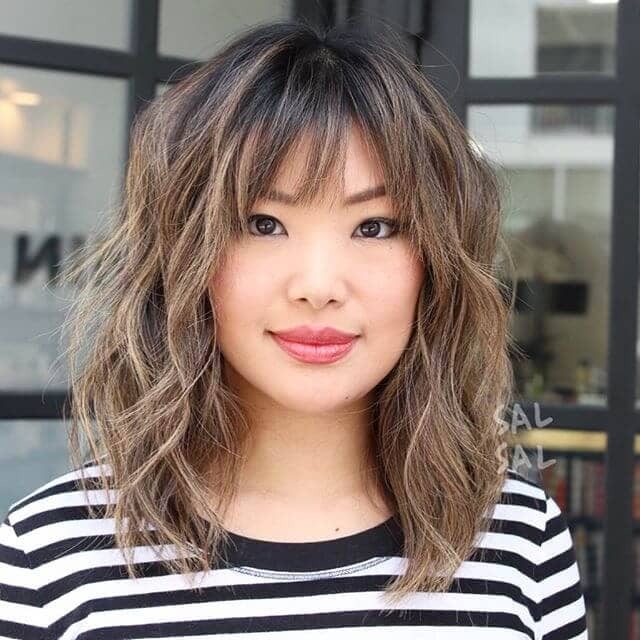 This beautifully colored balayage hair design has bangs that are long and slope naturally down from the center of the forehead. They are worn below eyebrow level for a fresh and updated look for 2018. These bangs are not layered very much and are not particularly tapered into the rest of the hair. These bangs are worn swept to one side for a fun and easy look. A loose, messy braid highlights the side of the hair, complementing the side bangs. 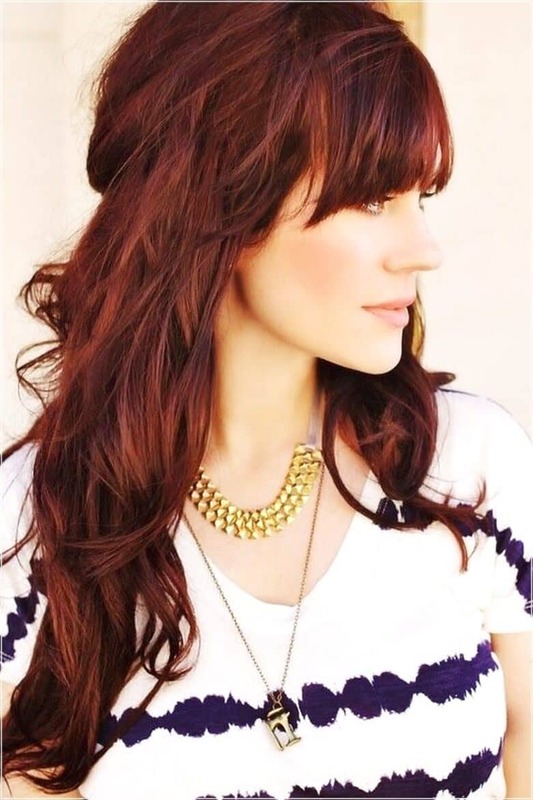 This medium hair with bangs has a fresh and casual look. The hair is layered at the ends and cut with a razor. 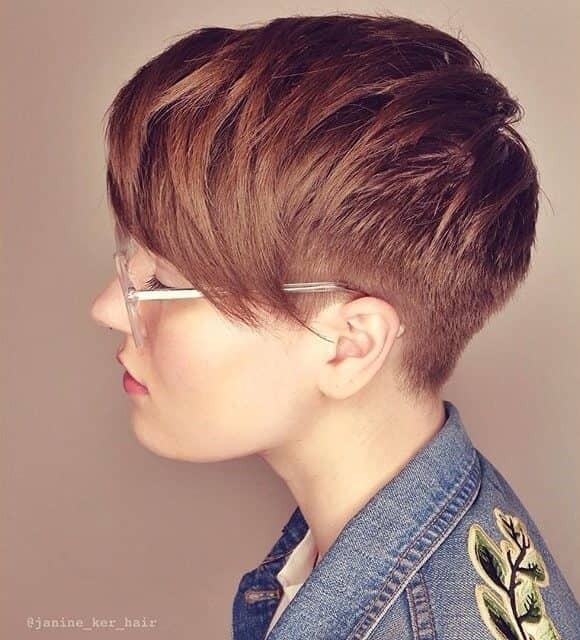 This hair is worn clipped short around the back and sides. Side swept bangs complete the look. The bangs are layered a little bit and complement the model’s glasses. The contrast between the side swept look and the closely cut back gives a fun and updated look. This cute haircut for a girl features bangs that are worn short and gently swept to the sides. They are tapered from the center out to the sides. The bangs are blended in naturally with medium length hair. They give a fun, relaxed look and go nicely with soft waves. 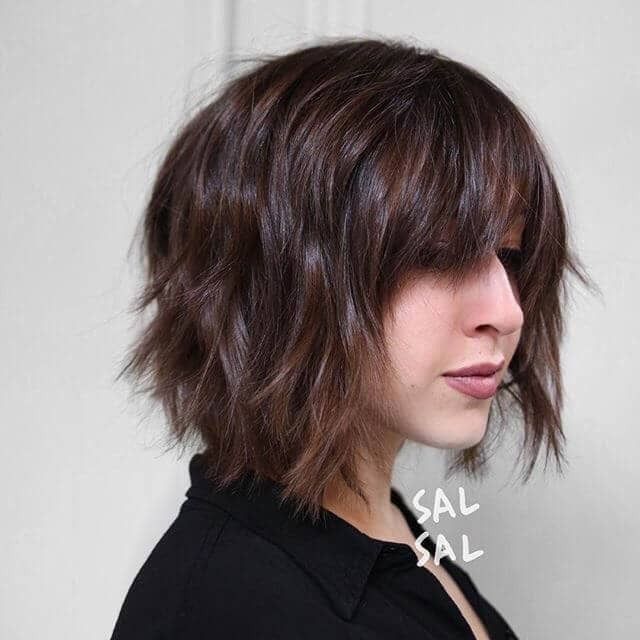 This is a sleek long bob with eyebrow-length bangs. They are slightly tapered toward the middle to keep the look from being too severe. They are thick bangs and are not layered at all. This style is simple and classic, for wear by anyone with a serious sense of style. This model has medium length hair worn in long layers for movement. Medium length haircuts are great because they can easily be dressed up or down depending on the occasion. The bangs are worn at about eyebrow length and are tapered down at the sides to blend in with the rest of the hair. The hair is worn tousled for a casual look. This model has long, gorgeous hair done in a balayage style from rich chestnut brown to blonde. The bangs are layered nicely to frame the face and the hair is worn parted to the side. This pretty hairstyle is worn with a soft and glossy shine. The ends curl into gentle waves. These bangs are worn below eye level for a casual look. The bangs are tapered toward the sides of the head and blended into the rest of the hair. The hair has long layers cut into it for a look with a lot of soft movement. The hair has a beautiful blonde shine. This is a very cute haircut for a girl. It has bangs that are worn almost straight across the forehead. They are layered a little for a less severe look. The hair is cut short and neat and then tousled with a little product for a fun and charming look. These long fringe bangs fall across the model’s forehead and frame her face with gradual layers. The bangs are smooth and neat for a more formal look. The updo is dressy but not too formal with a little bit of mess involved. This style would be great for anyone with long hair. 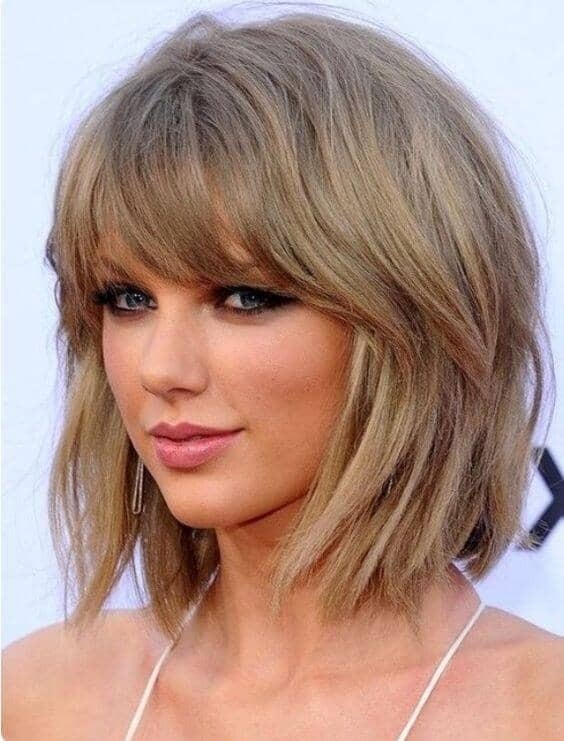 In this photo, Taylor Swift wears her hair with medium length bangs that are gently swept off to the side. The bangs fall just below eyebrow length. The hair is worn in long layers and is tapered nicely toward the bottom. This is one of the best medium haircuts out there and it looks nice on everyone. This is a nice short haircut for women. This haircut features sleek bangs that are worn above eyebrow length. The hair is worn in a smooth bob that slants toward the front. This style has skillfully applied blonde highlights. This is a good example of one of the many types of bangs. This is a great look for girls with bangs. The model is wearing soft, straight bangs that hang below eyebrow level. They are cut straight across the forehead with a little bit of wispiness for more movement. The relatively short bangs set off long, gorgeous red waves. The length of the bangs looks extra nice with the model’s glasses. These bangs are worn a little lower than eyebrow length and are softly layered so they are not too severe. They are worn smooth and perfect across the forehead. The hair is parted slightly to one side. The top of the hair is worn back for a neat and classic look. This style has short, tapered bangs that blend into the rest of the hair. The hair is worn in gentle waves to frame the model’s face. This is a cute hairstyle for girls who want to stand out a little bit from the crowd. The highlights are pretty and soft. 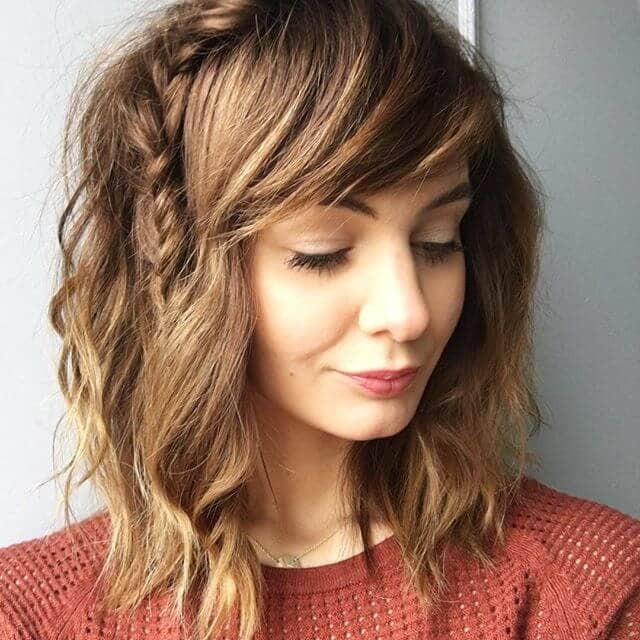 This long hairstyle for women has straight bangs that fall at eyebrow level and are not tapered into the rest of the hair. The bangs are smooth and even to frame the model’s face and bring out her eyes. The hair is tapered forward, shorter at the back and past shoulder length at the front. This cut features a long, straight fringe of bangs in the front. The bangs are tapered slightly to the sides but are not cut into the rest of the hair. They complement the smooth, shiny long hair as a whole. This is one of the many cute hairstyles for girls. 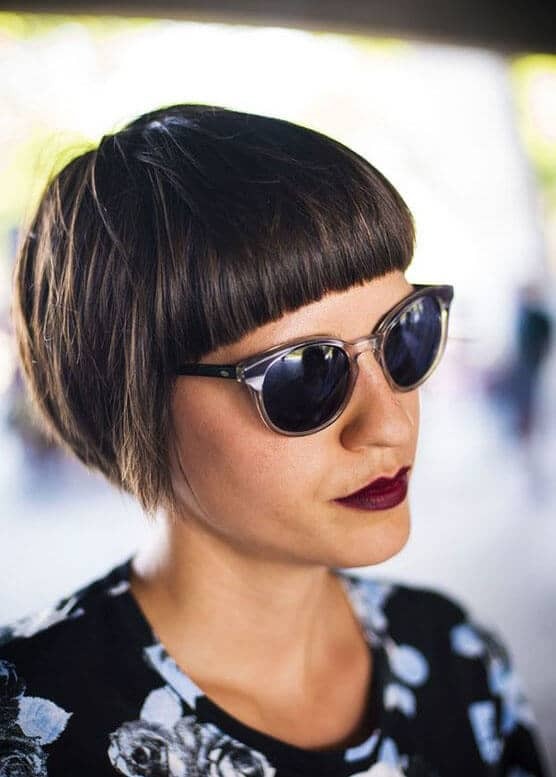 This haircut features girls with bangs that are straight and smooth. They are cut directly across the forehead with no layering or tapering. They set off the model’s eyes and show off her glasses. This cute haircut features a big bun in the shape of a bow, made from the model’s own hair. This is a fun modern hairstyle that anyone with long enough hair should try . These bangs are worn at eye length and have a lovely, soft texture. The styling keeps them from looking too heavy across the model’s forehead since they are not tapered into the sides of the haircut. The model’s red hair is worn tossed over one shoulder in a relaxed fashion. The hair has a lot of long layers for movement and softness. These bangs are long and swept off to one side. The look is simple and carefree. The bangs taper down to blend with the rest of the hair, which is worn long and shiny. Blowing the hair out or using a flatiron would give this kind of straight, smooth look. The bangs in this hairstyle are worn long and tapered out toward the sides to blend with the rest of the hair. They are a little wispy and cut to be soft and face-framing. The bangs hang down from the face and contrast with the adorable updo. The hair has very nice highlights with a blonde, natural shine. This cut is one of the different ways to wear bangs hair. The bangs are cut to about eye length and shaped to lay naturally across the forehead. They are tapered down to blend with the rest of the hair. The model wears the bangs mostly straight. The back of the hair is pulled up into a nice bun. This look is worn in soft waves for a relaxed weekend look. The bangs are swept off to one side and are integrated with the rest of the hair. The look is fun and easy with loose finger waves and a pale blonde color. Try this look for your next weekend away. Unlike many of the other types of haircut we looked at, these bangs are worn short and perfectly straight across the forehead. This is a modern hairstyle and very fashion forward. The hair is cut into a smooth pixie style and brushed to a glossy shine. This is one of the cute hairstyles for girls who look outside the box. These bangs are worn at about eye length and brushed apart so they don’t hang right in the model’s face. They are cut into wispy layers for a soft and pretty look. They are tapered into the hair and gently frame the model’s face. The hair is long and gorgeous with a lot of shine and a gentle wave. This cute hairstyle has soft, loose waves and wispy bangs. The bangs are cut at eyebrow length and taper down from the center of the forehead to the sides. This look is relaxed but could easily be dressed up with an updo. It would go just as well with a casual weekend dress as with a formal work outfit. Kendall Jenner’s bangs are cut long, falling down past her eyes. They taper to a long point in the middle and get gradually shorter as they go out to the edges. These bangs are soft and relaxed looking, contrasting with the formal updo, outfit, and jewelry. This look is a charming throwback to the 1980s era of big hair. The bangs are worn at about eye length and are tapered into the hair. The crown of the hair is teased a little and the sides flow down in rocker waves. This is one of the retro ways to wear bangs hair. This is one of the prettier hairstyles with bangs. 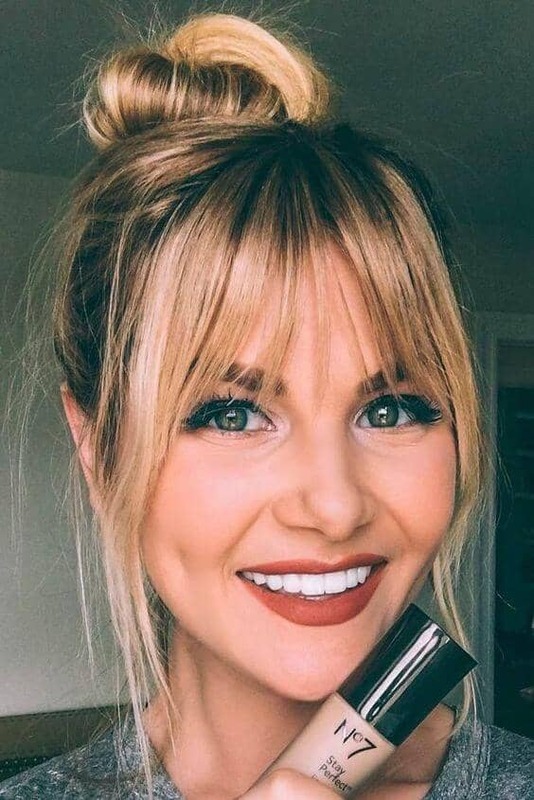 These bangs are worn long and swept to one side. This is one of the types of haircut that anyone with long hair should think about getting. The hair is worn with several levels of long layers for softness and a sense of movement. The color is a gorgeous pale blonde. 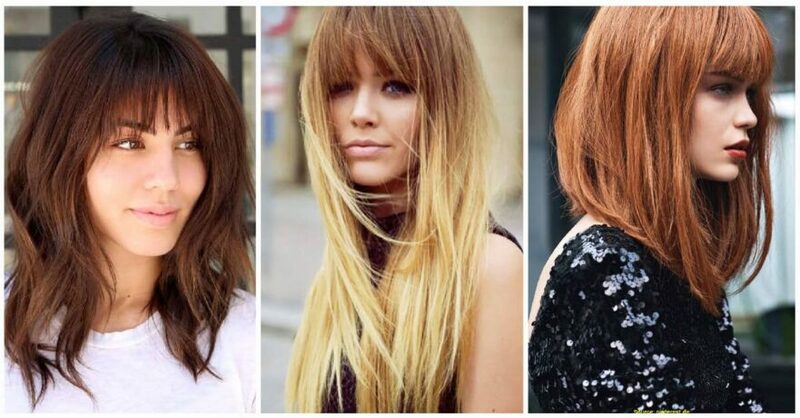 The ends of these bangs are varied to give a choppy, varied look. Girls with bangs would love this look. The bangs taper into the rest of the hair. The bangs are styled to look spiky and asymmetrical. The hair is worn in very loose waves and has a windblown casual style. This look would be great for a weekend or a night out. These bangs are cut into the rest of the hair with long layers. The bangs style matches many of the other haircuts we looked at. They loosely frame the face and make a great foil to the dark sunglasses worn by the model. The hair curls gently in smooth, loose waves. This is one of the cuter hairstyles with bangs. The bangs are worn long and swept to one side, framing the face in charming layers. 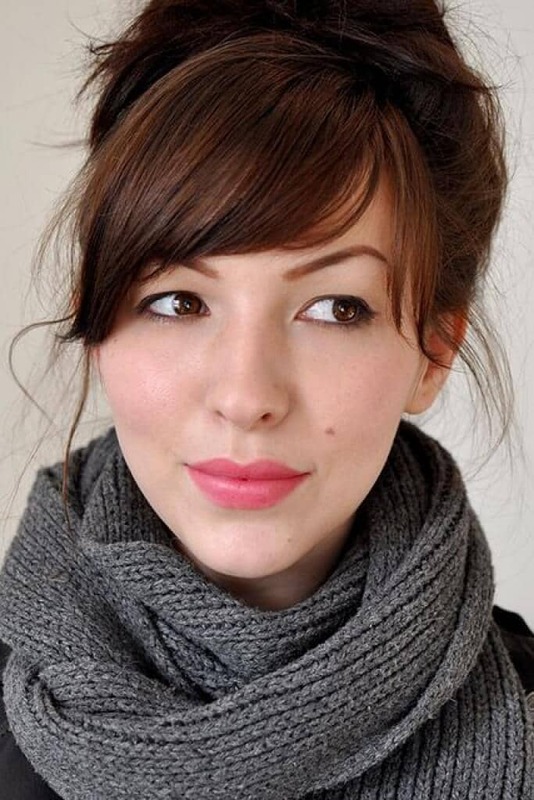 The casual bangs are set off by the quirky updo and the warm, fuzzy gray scarf. This is a good look for any cold winter day. This is another rock-inspired look with a little bit of punk sensibility. The bangs are long and a little choppy. They are tapered into the sides of the hair. The hair is layered to medium length and is worn in an edgy shoulder-length style. This look would be great for anyone who wants to have a little fun with their bangs. 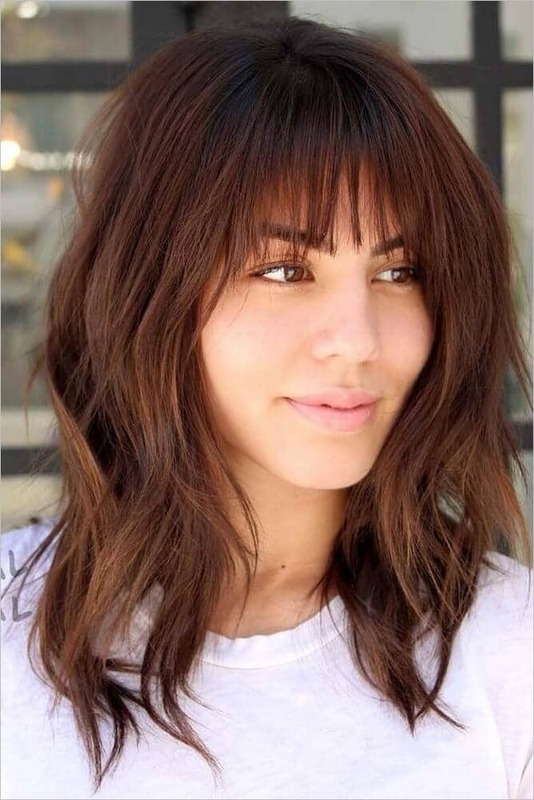 This hairstyle with bangs starts with eyebrow length bangs cut straight across the forehead. 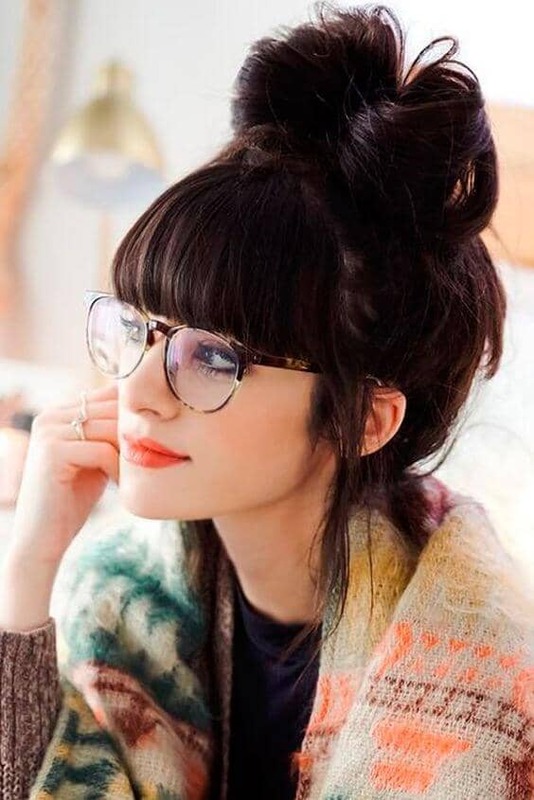 These bangs frame the model’s face nicely and complement her glasses. The hair is worn medium length with a little bit of a loose wave for movement and softness. This is one of the cuter medium haircuts out there today. 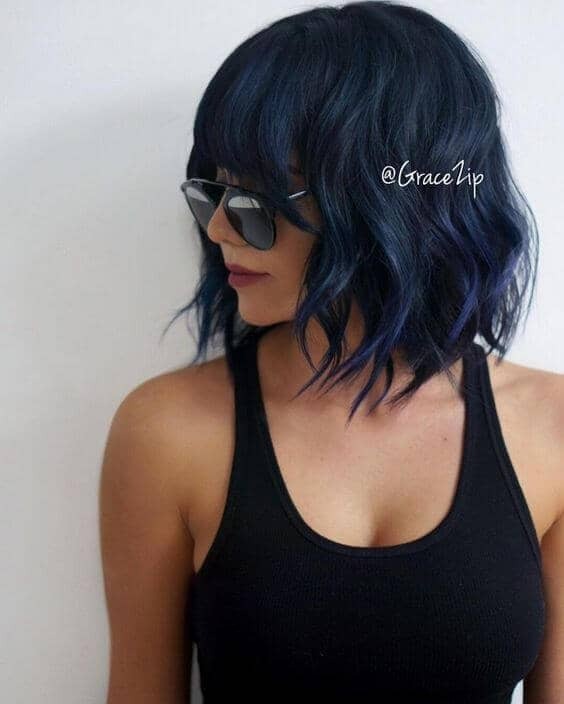 This is a gorgeous example of short hair with bangs. 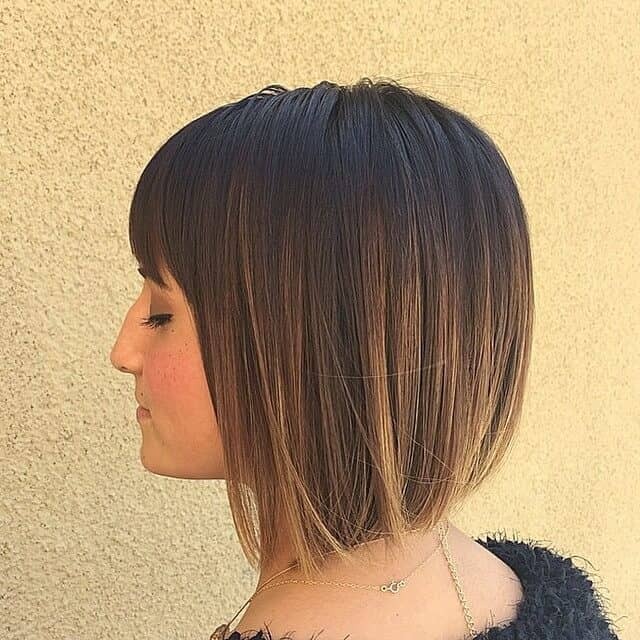 The hair is cut into a glossy, perfect bob. The bangs are cut perfectly straight across the forehead at eyebrow length. They are not layered or tapered in any way. The rest of the hair tapers in length from back to front. 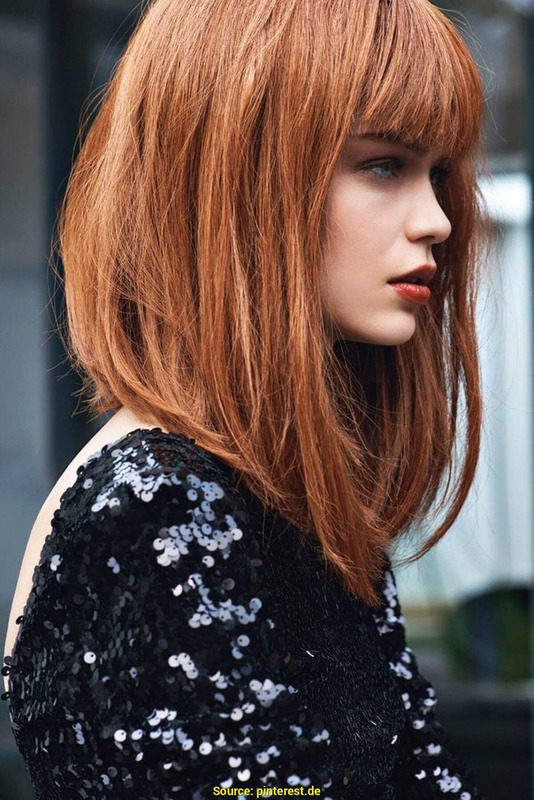 This short hairstyle with bangs will set you apart from the crowd. This is one of the more relaxed women’s haircuts with tapered, layered bangs that fall at eye level. This is an easy hairstyle for anyone with long hair to wear and would be great for any occasion from dressy to casual. This model’s fuzzy blue jacket provides a nice contrast to her smooth hair. These bangs are tapered neatly to the sides, where they blend in with the rest of the hair. The bangs help to frame the model’s face and give the hairstyle a relaxed, casual look. The model has gorgeously highlighted ends that add to the beauty of her look. This style is fun loving and vibrant with medium length bangs and slightly spiky ends. 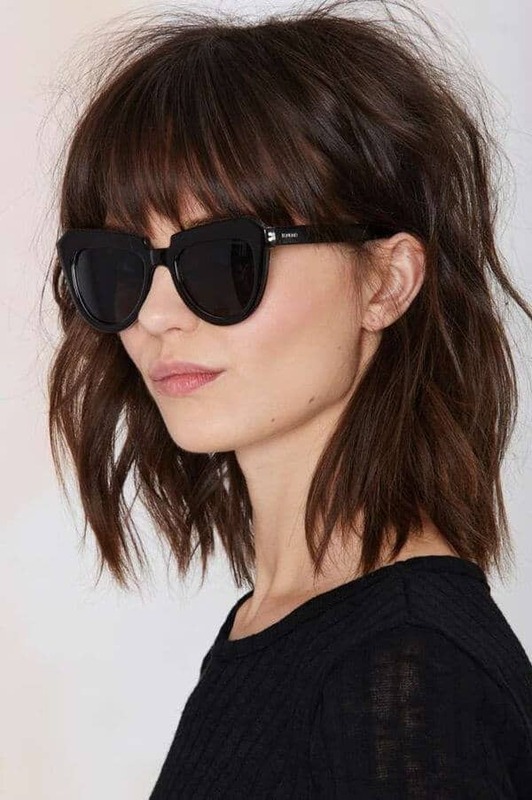 The bangs are cut at about eyebrow length and look great with the model’s sunglasses. The bangs taper gently out to the sides to blend in with the rest of the hair. This is a nod to 1970s style with shoulder length, layered hair. The model’s bangs are approximately eyebrow length and gradually taper to match the rest of her hair. This look would be great for anyone who appreciates the hairstyles of the past but wants to bring them up to date. This choppy short bob with bangs is one of the nicer examples of women’s haircuts. The bangs are medium length and fall around the eyebrows. They are tapered down at the sides to match the rest of the hair. The hair is worn in gentle finger waves for a pretty effect. Take some of these cool hairstyles with bangs to your favorite salon and ask your stylist to come up with an awesome new look for you. Cutting bangs doesn’t have to be scary if you know what to expect. 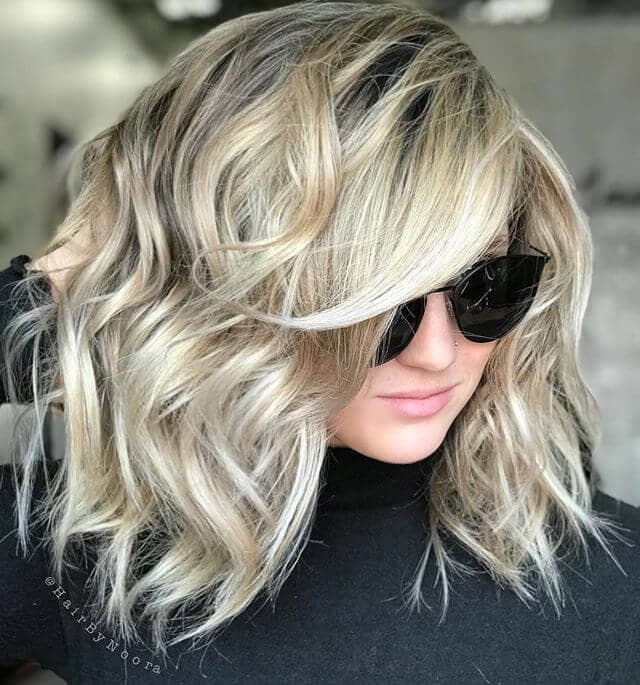 You can choose from soft, natural looks with lots of tapering and layers or squared off, contemporary looks with sleek bangs and bobbed ends. These women’s haircuts are all beautiful, and there’s something for everyone. Whether you have short, fine hair or a long, gorgeous mane, you’ll find just the right women’s haircuts for you.